05 Jul 2018 / 10:20 H.
Primeworks Studios’ latest film Pulang is based on a story that is very close to the heart of its CEO Ahmad Izham Omar. Actor Remy Ishak plays Ahmad's grandfather Othman. A RECENT private screening of Primeworks Studios’ latest film Pulang has its chief executive officer, Ahmad Izham Omar, and his father, Omar Othman, in tears. The story is something very close to their hearts. “Pulang is inspired by my grandfather’s life,” explains the 49-year-old Ahmad, who says his grandfather, Othman Alias, was a poor fisherman from Malacca. Determined to give a better life to his wife and son, he took up a job as a sailor on a British merchant ship and sailed around the world. Though Othman promised to return home, he never did. “My father was only 11 years old when his father left,” recalls Ahmad, who co-wrote the screenplay with screenwriter Mira Mustaffa (Nur kasih: The Movie, Anak Merdeka). Ahmad says his father managed to track down his grandfather in England, in the city of Liverpool, in the 1960s. Unfortunately, he failed to bring Othman back to Malaysia. In 2008, the then 39-year-old Ahmad decided to track down his grandfather, as he wanted to know why Othman never returned home. Also, as Ahmad says, “when you get older, you want to get close to your roots, your heritage and your family”. So did he meet his grandfather? Did he find the answers he was looking for? Actor Remy Ishak plays Ahmad’s grandfather Othman, while popular TV actor Azrel Ismail makes his film debut as Ahmad’s father, Omar. Playing Ahmad himself is Singapore-born actor Erwin Dawson. Directed by Kabir Bhatia and made with a budget of RM6 million, Pulang will hit cinemas nationwide on July 26. The film is set in various locations including Malacca, Hong Kong, Okinawa, Jeju Island and Liverpool. Kabir and his team looked at pictures from 1940s, and used CGI (computer generated imagery) to recreate the settings. Some quarters have labelled Pulang as Ahmad’s ‘syok sendiri’ (vanity) project, and accused him of abusing his power to get the film made. While researching the past for this story, he learned that in the 40s, many Malay men left their families behind to work as seamen on merchant ships plying the oceans. “The captains of these merchant ships liked hiring Malays because they made better seamen,” ahamd says. His research included reading Tim Bunnell’s book, From World City to the World in One City: Liverpool through Malay Lives. 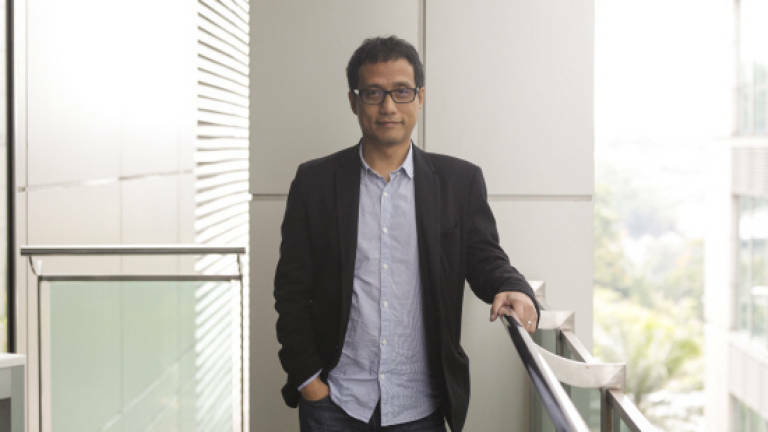 Bunnell, an associate professor in the Department of Geography at the National University of Singapore, traced the migration of Malay sailors from Singapore and Malaya who settled in England during the 1950s and 60s. Lead actor Remy (above) also believes the film highlights the importance of family. The actor confessed that he initially had a hostile relationship with his own father. Remy was totally captivated by the script and the depictions of the relationship between a father and his son, and the relationship between a grandfather and grandson, touched his heart. It eventually pushed Remy to reconcile with his own estranged father, and now both father and son share a warm relationship. “Sometimes, a good script can make you a better man,” Remy says.